For years collectionHQ has been transforming how public libraries work, providing the tools required to improve collections efficiently and effectively. Interoperable with any Integrated Library System (ILS) and sold on an annual subscription basis, collectionHQ is delivered over the internet. collectionHQ consists of a suite of highly-integrated modules, providing a full set of powerful tools that support the collection management and development process in public libraries. Find out more about how collectionHQ has helped libraries with their performance and management. Our unique and powerful Selection Module has been designed to streamline the selection process, eliminate wasteful purchases and also bring automated, web-based performance management tools to the selection of library material. It can also be used to improve vendor standing order plans and lease plans. Specify: collectionHQ enables evidence based selection specification allowing you to create detailed spending plans at a collection and branch level – in seconds. Discovery: When making selection decisions, it’s useful to see what’s circulating and being purchased by public libraries elsewhere. collectionHQ’s Discover tools allows users to see what titles are performing well on a local, regional and national level. What’s more, collectionHQ allows users to compare those popular items against their own holds records. Monitor: collectionHQ’s powerful monitoring suite gives you a detailed breakdown of the materials you have received, order by order, and shows what genre (BISAC or your collection terms) or Dewey ranges they were in. This then allows you to see how the acquired materials compare with the targets you specified in the budget, order or contract. To support Selection even further, collectionHQ and Baker & Taylor have introduced Evidence-based Selection Planning (ESP). ESP streamlines collection development and helps to equip libraries with the titles they need, when and where they need them. Click here to find out more about this service. Click to view collectionHQ supported browsers and applications. collectionHQ’s powerful Management Module is based on the proven Evidence Based Stock Management methodology. This gives clear advice, via Collection Action Plans*, on what to do with your collection at item level in order to maximise its effectiveness and generate more turnover. All of collectionHQ’s Collection Action Plans can be output directly from the application electronically. They can also be sent to any RFID handheld reader directly. Remove: Weeding of under used (Dead) and over used (Grubby) items can be time consuming and is difficult to implement on a regular basis. collectionHQ Action Plans bring considerable time savings to collection management activities by directing staff to the items requiring inspection or removal. Refresh: Make the most of your existing collection and eliminate waste with collectionHQ Transfer tools which support the replacement of overused or missing items with material already available in your collection, and the movement of poor circulating items to locations of higher demand. As with all marketing – If You Don’t Measure, You Can’t Manage. We need to be able to justify which marketing campaigns and experimentation we carry out and try to improve performance year after year. Experimental Placement: collectionHQ gives the ability to measure the effect of moving parts of your collection from one location to another. This could be either inter- or intra- branch. Experimental Purchase: collectionHQ gives the ability to measure the effectiveness of buying material in small quantities. This could be in response to suggestions from customers or branch staff and gives you a robust feedback mechanism for communication of results. Improving collection performance and aligning collection supply with patron demand not only relies on evidence but on careful evaluation and assessment of selection, management and promotional procedures. Processes to monitor performance allow librarians to identify areas of the collection which are improving and those which need to be improved – areas that are understocked, overstocked or “grubby” to name a few. For library management, performance monitoring provides valuable insight into how branch staff are managing collection management activities. collectionHQ offers a variety of tools which make this level of performance monitoring possible. Staff and library management can monitor the success of collection management activities and identify areas for improvement with a variety of action plans for Fiction, Non-Fiction and Non-Book collections. Library management can use collectionHQ activity action plans to monitor how their staff is managing the collection with collectionHQ, enabling them to identify any areas where extra training is required. 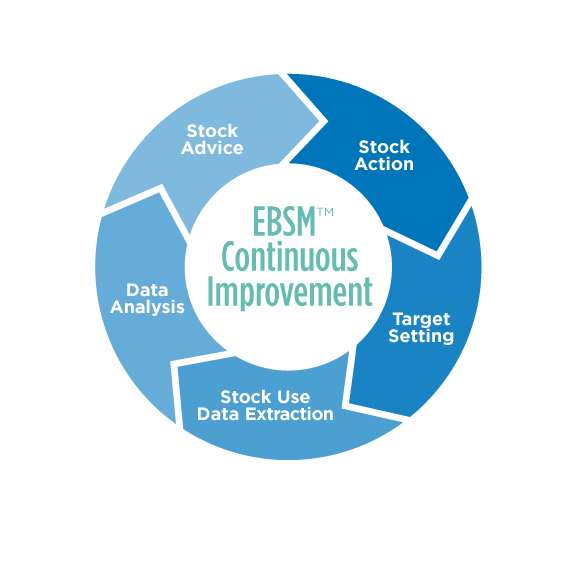 EBSM is a complete methodology for Collection Performance Improvement which assists librarians in making the management of the collection more effective, more customer focused, less wasteful, more measured and performance based. 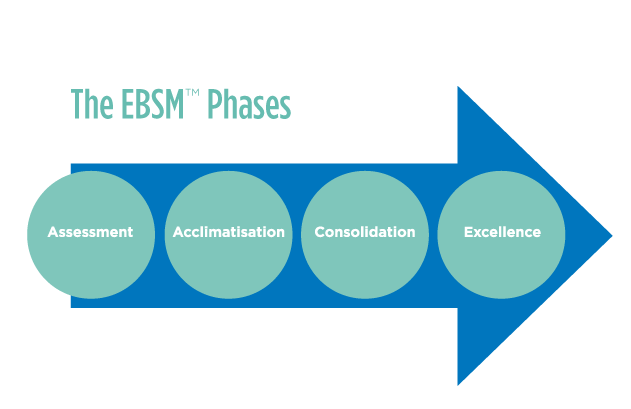 Used in libraries for over 21 years, the repeatable EBSM framework uses data from a library’s own ILS/LMS database along with local target settings as its evidence base. The powerful EBSM toolset uses this evidence base to perform complex comparisons between the locally set targets and the current situation to provide a series of action plans to help library staff drive performance towards targets.